1. In a small pan, gently warm the olive oil with half the lemon zest over a low heat for 10 minutes. Cool and set aside. 2. Place the asparagus in a large pan of salted boiling water. Allow the water to return to the boil and cook for a further 45 seconds until just tender. Remove the spears from the pan with tongs, place in a colander and refresh under cold running water. Gently pat dry and place in a bowl. Season and spoon over 1 tbsp of the lemon-infused oil; set aside. 3. Combine the herb and rocket leaves in another bowl. Spoon over another tbsp of the lemon-infused oil, season and toss together lightly. 4. To serve, pile the rocket mixture onto four plates or one large serving plate. 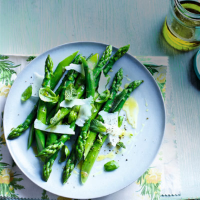 Arrange the asparagus and pecorino over the top. Drizzle over a little more oil. Sprinkle with a little more lemon zest and a squeeze or two of lemon juice.